Celebrating a special occasion doesn't always require a sit-down meal at a pretty table but sometimes instead, a special get-together involves a help-yourself buffet. 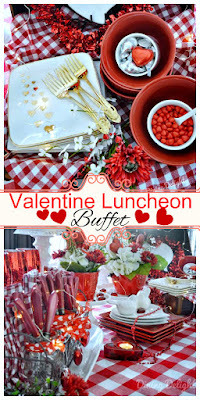 With that in mind, I designed a table layout that might be perfect for a Valentine luncheon buffet. 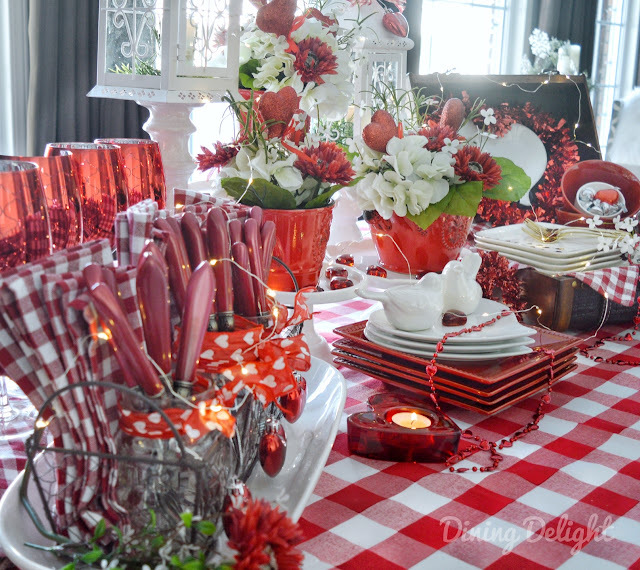 Even when food is served buffet style, it's important to make the set-up look festive. 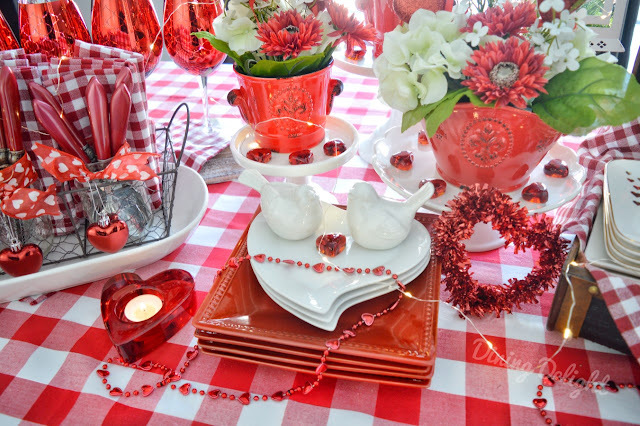 Placing the dishware, flatware and stemware on the table in unique and interesting presentations will make the occasion feel extra special. 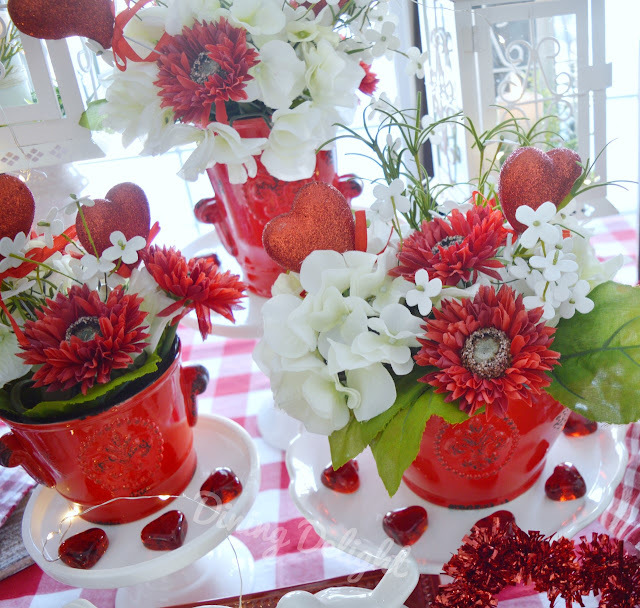 Start with a centerpiece - here, I've used faux florals and hearts in red pots placed on cake plates. In front of the centerpiece, two lovebirds sit atop white heart shaped plates and some red square ones. Behind the floral centerpiece sit a couple of white lanterns placed on pillar candleholders which add height and provide a backdrop. Add a few Valentine decorations such as this heart-shaped candleholder. 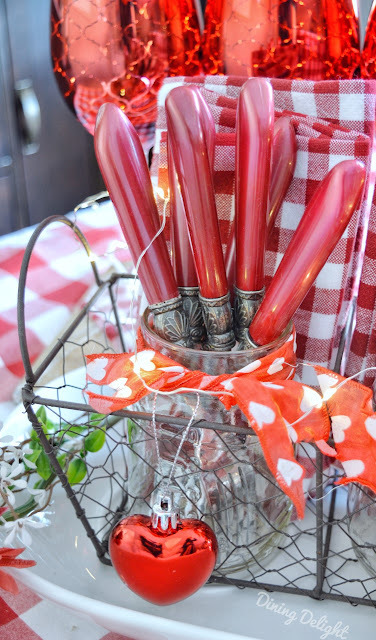 The cutlery was placed in mason jars inside a wire basket with red-checked cloth napkins behind. 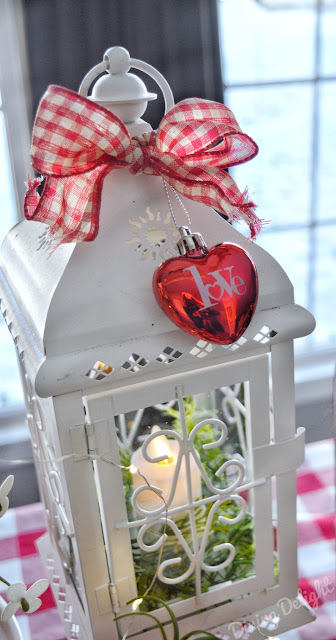 Each mason jar holder was embellished with hearts and ribbon. 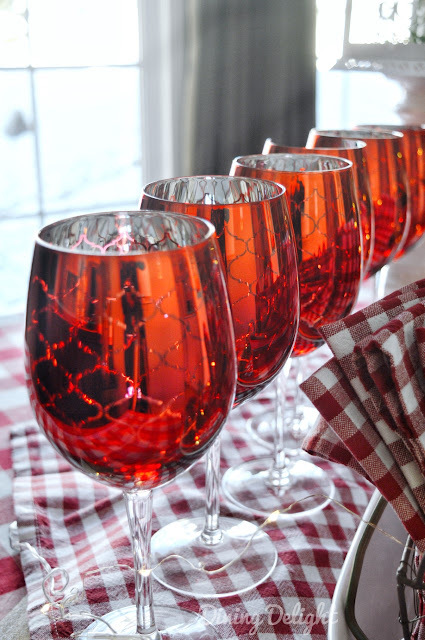 The stemware was placed behind the cutlery basket on top of a tray covered with a cloth napkin. These were from Pier 1 in the clearance section. 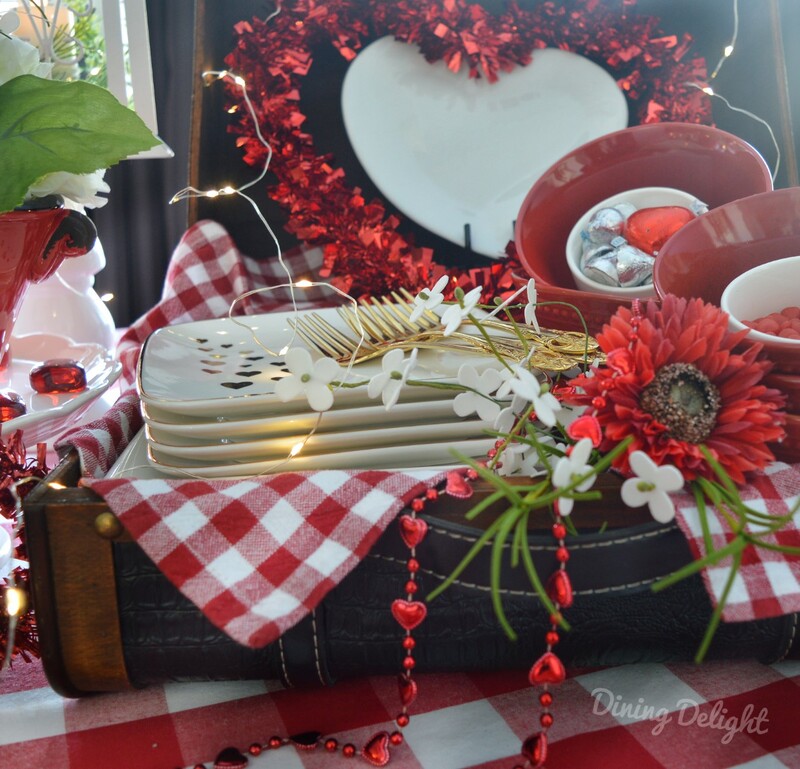 On the other side of the centerpiece, I've placed plates and bowls inside a small wooden case lined with cloth napkins. 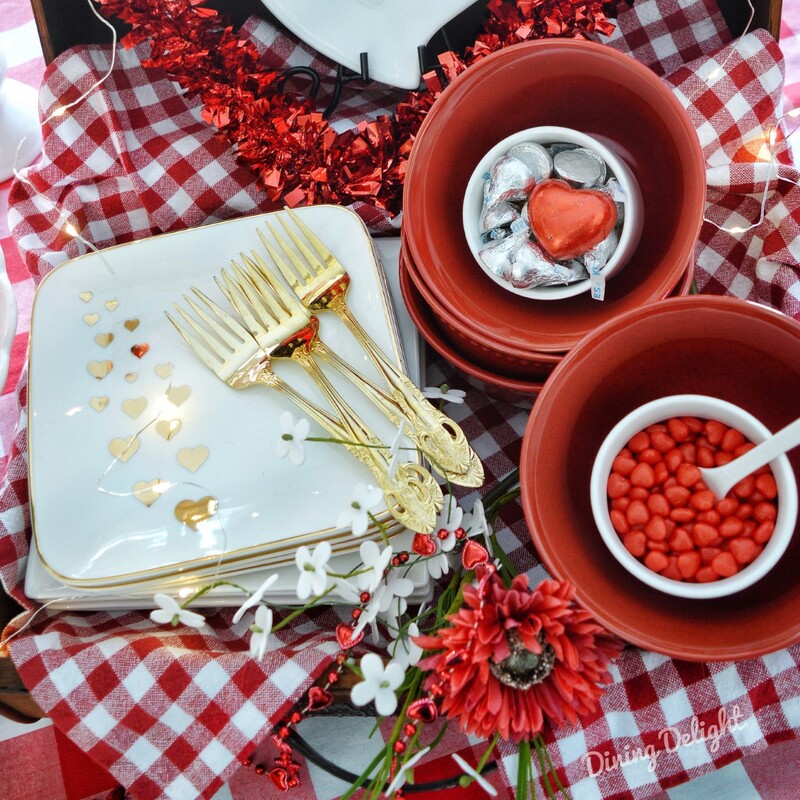 The gold-heart plates were a gift and work wonderfully for Valentine's. 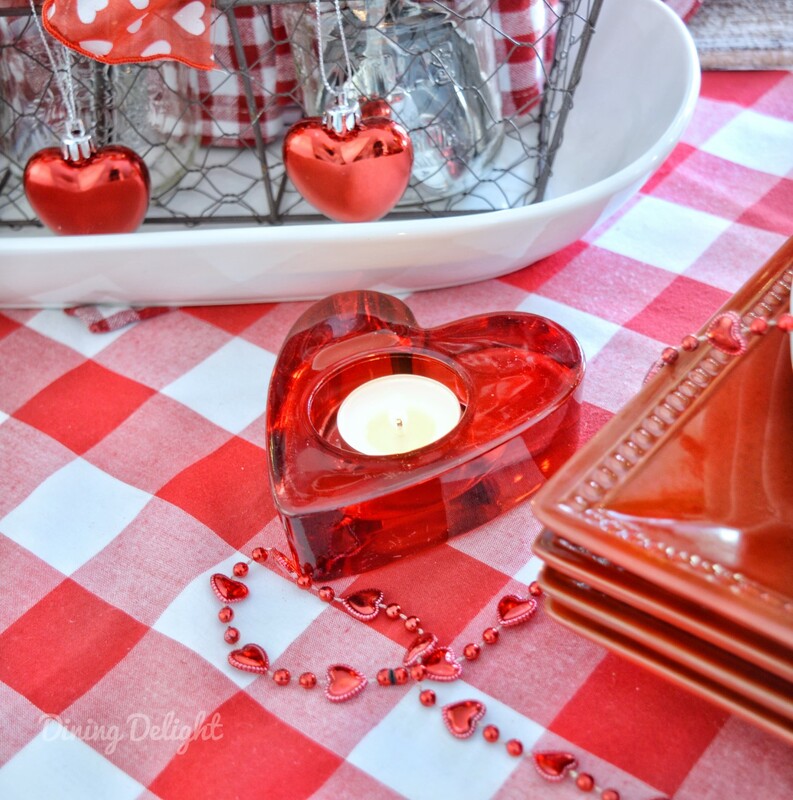 Hershey kisses and cinnamon hearts add to the display. When we serve buffet style, the food is placed on the kitchen island so the dining room table is where guests grab their plates on the way to the kitchen. For extra sparkle, I've draped a string of white battery operated mini-lights over the table. Hope I've inspired you to add a few festive touches to your next buffet setting and if it happens to be for Valentine's Day, all the better! 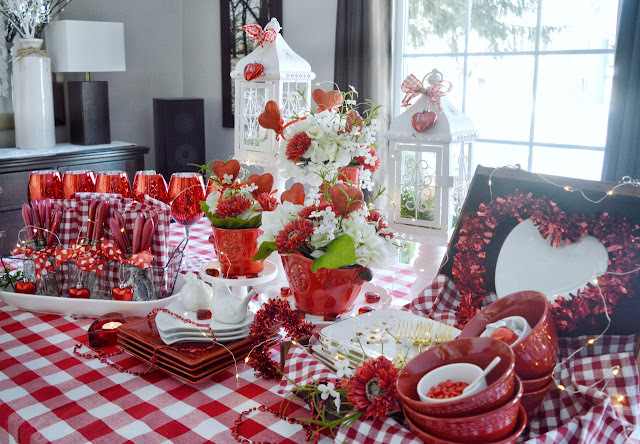 What a beautifully decorated table. ❤️ so many beautiful elements. It all came together nicely. I love the red glasses and the red checkered napkins. Very nice. 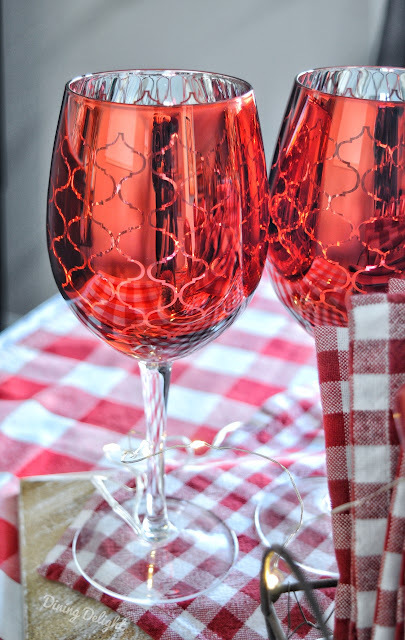 Love all the sparkle and shiny red! 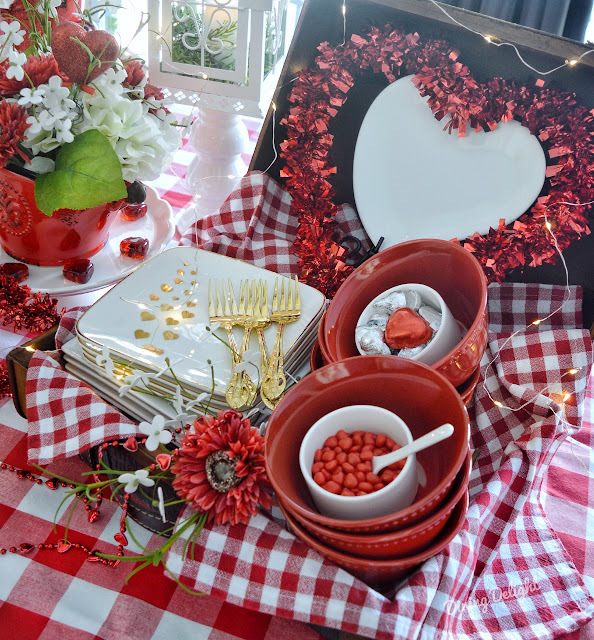 Your buffet table settings are always so fabulous and full of eye candy Lori! This is so adorable, so many pretties! Love the red stemware! 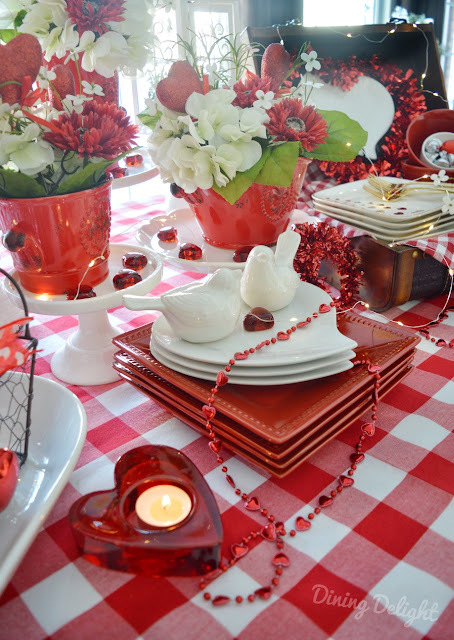 Lori, your tables are always so pretty, this is no exception. 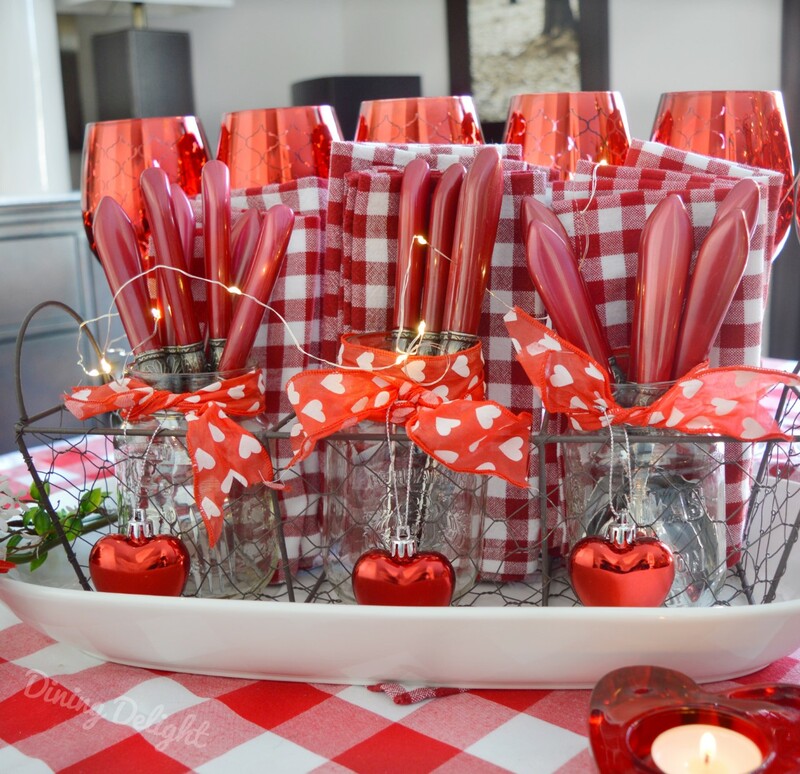 Love the idea of making the brunch festive and your ideas seem to be very practical, using items you already have in your decoration stash! Inspirational! Happy Valentine's Day! Wow! What a great buffet for a Valentine's Day luncheon. Love every inch. 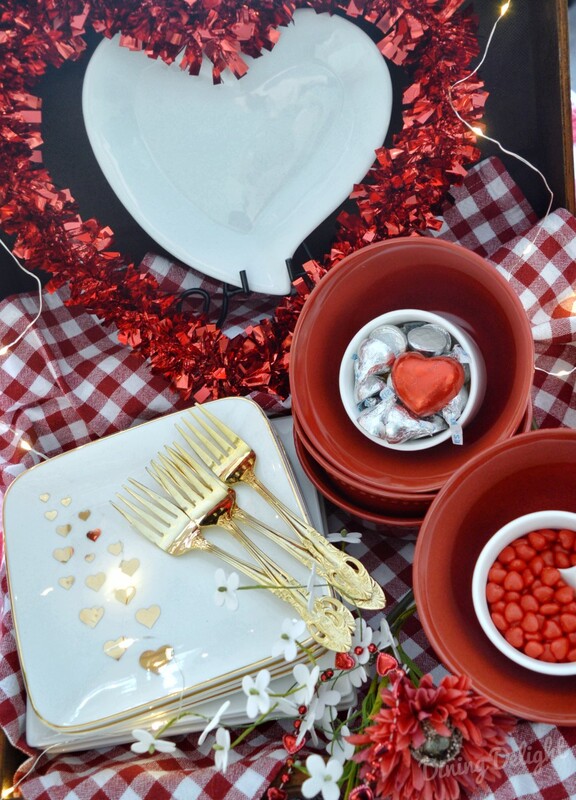 All the red just screams Valentine's Day and step up to the buffet. Love the case with the dishes sitting inside. 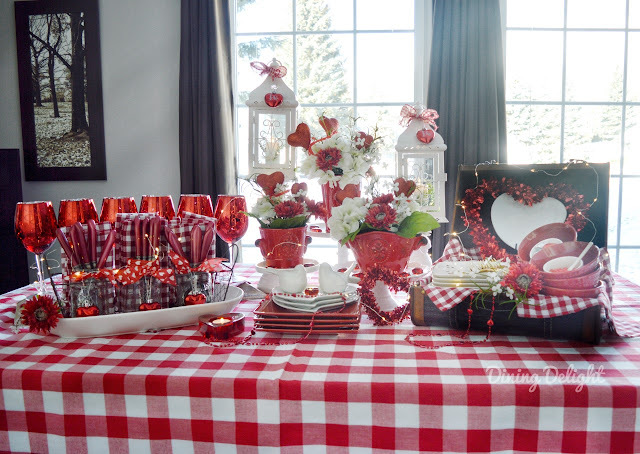 I never would have thought of red checked for VDay for it is perfect. Great job Lori! Such a lovely Valentine's buffet, Lori! You did a beautiful job! 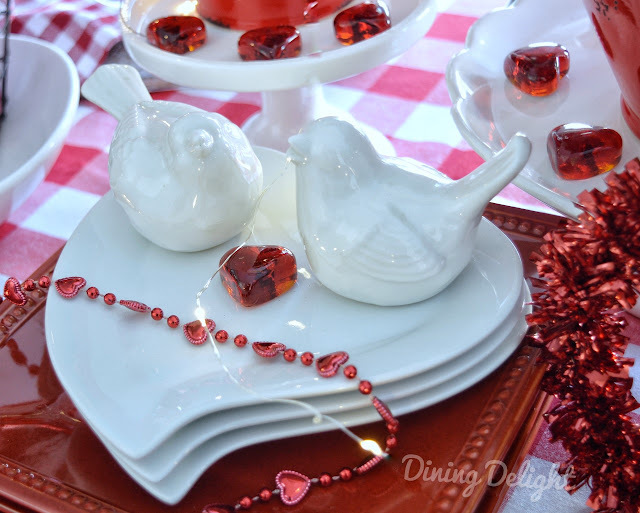 Thanks for sharing at Homestyle Gathering, friend!